Sowing Up A Tray Of ‘Rainbow’ Chrysanthemum Seeds. I’ve got high hopes for these Chrysanthemum ‘Rainbow’ seeds this season…I think they will spread their hippy love all over Cornwall. *I have chosen to sow them in individual pots…covering the seed lightly…just enough to cover them. 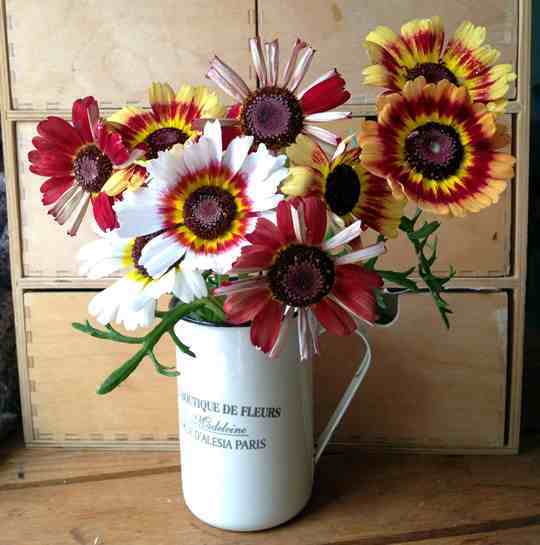 *As Hardy annuals you can make an Autumn sowing too. *I sowed this tray fairly liberally…you get loads of seeds in each packet…I will simply only leave the strongest seedling in each pot. *My chum Karen says she thinks you get stronger plants if your direct sow into the ground…she may be right….I will do both this year and see what happens…certainly autumn sown seeds would provide bigger and stronger and earlier plants…but being that I didn’t sow any in the Autumn and that I am one time machine and a scarf short of being Dr Who, we will have to wait to find out in 2015. 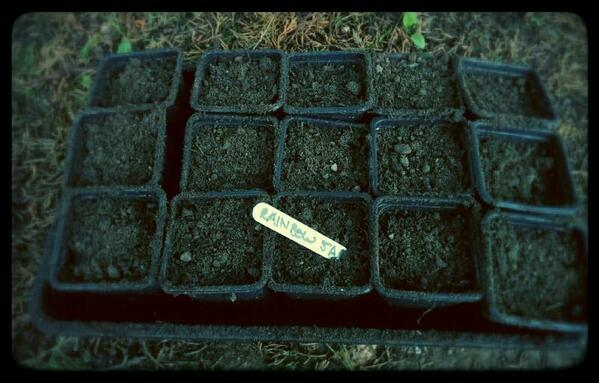 *Karen thins her seedlings out to 20 cm….which seems very metric to me…I am doing mine to a hand span width. Have fun with it if you are growing it this season….try showing it with spikes of Larkspur and some Nicotiana ‘Lime Green’ to calm the colours down a little.